PPF offer a wide range of independent site investigations. We can advise on the most appropriate form of investigation and carry out all works from a simple drain survey to a full soil investigation including chemical testing and a desk top study. By working closely with structural engineers and local authority’s PPF can arrange all the necessary pre contract site investigation to ensure the correct foundation solution is provided. 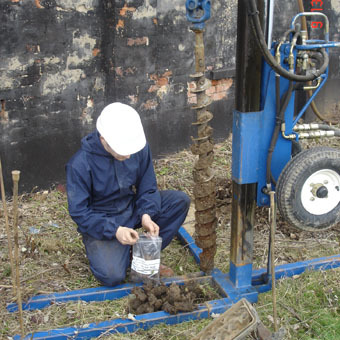 The most common site investigation when preparing for piled foundation is to undertake a borehole. This will identify the method and design of piles required. The test bore information can also help when designing reinforced concrete ground beams, reinforced concrete rafts and underpinning solutions. To organise your site investigation directly contact Chelmer Site Investigations. When subsidence is in question we can offer crack monitoring, trial pits to expose existing foundations and short bore holes which can identify the causes of ground movement.